Pat Lipsky Sutton’s geometric paintings are as many-faceted as a finely cut gem — one that is forever tipping and tilting. “I’m really very consciously going after a feeling of vertigo and disorientation,” she says, walking around her current show, Paintings in Close Value, at Virginia Miller Galleries. Working with a limited palette, Lipsky mines a reverberating host of visual and emotional nuances. The mostly black or mostly brown pieces are indeed “close-valued.” That is, the colors in each are of the same intensity or value, so that no single color dominates. Despite these parallels, however, the works convey a slippery, edgy sensation, the feeling of losing one’s bearings in what should be familiar territory. That territory is the square within the grid, bounded by the comforting regularity of repeated right angles. Lipsky, however, excels at making irregular what we would assume to be regular. 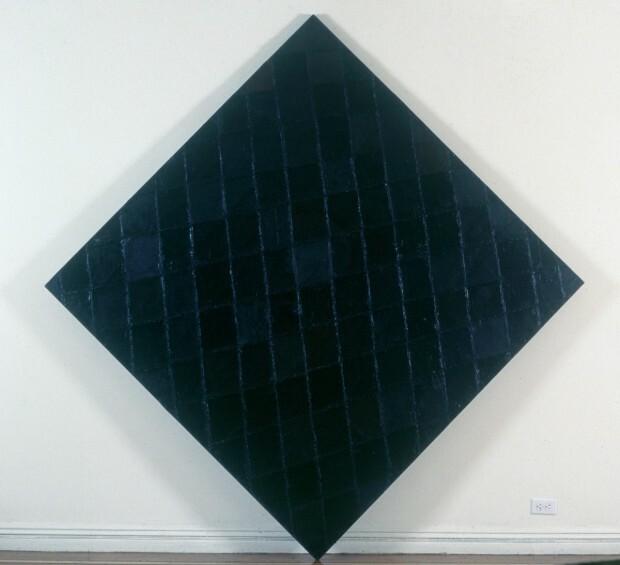 The square canvases, hung so that they resemble diamonds, are scored with blocks of color, forming an uneasily sloping grid, one that fails to line up with the edges of the canvas. The blocks of color are often closer to parallelograms than squares, with tilting lines where vertical ones should be. They seem to be undergoing the stretch and pull of some unseen force, gravity perhaps, sometimes even appearing to recede into space. In History, for example, marks of stress interrupt the cool, formal geometry of the grid. Encrusted seams of heavily layered paint outline each block of color. In this truly remarkable work, the relief of another grid lies just beneath the surface of the painting. Slicing the upper grid with more diagonals, the piece draws the viewer into an ever more complex and dizzying web of line and color. This vertigo adds an unnerving, emotionally charged twist to the tradition of sleek, impersonal abstract art that was in vogue when Lipsky came of age as an artist. Having studied with the rigorously minimal sculptor Tony Smith in the late 1960s, she achieved swift recognition in the New York’s art world with shows inthe early 1970s at the prestigious André Emmerich Gallery. Her paintings were accepted into the permanent collections of the Whitney Museum of American Art and the Museum of Modern Art. As the 1970s progressed, artists began tossing aside the strict demands of modernism, favoring anew the landscape, still life and figure. Lipsky also began experimenting with the still life, exploring both the personal and formal qualities of such mundane domestic objects as teapots and flowers. Her return to abstract painting bears the scars and question marks of her odyssey as an artist. Lipsky’s art is stronger, more richly ambiguous for that seasoning. Such ambiguity about the location of lines and shapes in space is echoed in her exquisite sense of color, especially in the mostly black paintings. Here, patches of deep maroon, blue and gray flicker among ever-changing shades of black, some silvery and reflective, others heavy and flat. This is a beautifully hung, contemplative show.